In recent years the amount of critical data monitored by operators in control rooms has been growing steadily. More than ever it is important to provide centralised, fast and secure signal distribution to all operator desks and to commonly shared video walls. Learn why a growing number of rail and air traffic control rooms switch to IP and cloud-based KVM and AV distribution systems, why this technology is reliable and future-proof, and how it enables you to save on your IT investment. 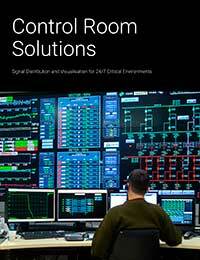 Control Room Brochure: Get an extensive overview of our solutions per category. Case Study: KVM Solution for a new Berlin Metro control room. Radian™ video wall processor allows you to compose multiple video walls with up to 64 screens of any size and is designed for fast switching and 24/7 operations. Drag and drop content from hundreds of different sources (DVI, HDMI, IP etc.) anywhere on the video wall - in real time. The chassis-based system supports 4K and is compatible with ultra high-definition displays. The Freedom II KVM Switch enables a single user to easily access information and control operations across four computer systems and monitors, saving time, money, and space. The solution works like an extended desktop switch on a single computer. Once you configure your screen layout for the attached PCs, switching ports is as simple as moving your mouse cursor over the screens' X and Y borders.